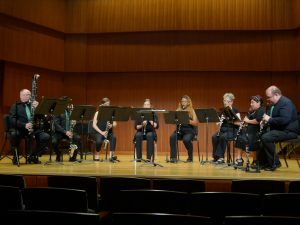 The Prickly Pear Clarinet Ensemble performed in Swarthout Recital Hall at 12:00 p.m. on Sunday, August 7, the last day of ClarinetFest® 2016. This clarinet choir consisted of eight members: Cathryn Boethel, Shaun Guzman, Jean Lake, Robert Lake, Leslie Mills, Stephen Moore, Trevor Ousey and Mark Wolocki. Brian Viliunas joined the ensemble to conduct a few pieces. The group filled the hall with sound from the very beginning of the program as they performed an energetic opener, Clare Grundman’s (1913-1996) Caprice for Clarinets. The ensemble displayed exquisite balance, sensitivity, and a lush, warm sound. The especially warm tone of the E-flat clarinet, which was displayed in the next piece on the program, Dodecaphonic Essay, by Elliot del Borgo (1938-2013), blended beautifully with the ensemble. The group played high altissimo chords at incredibly soft dynamics with impressive intonation. This piece featured sudden style changes and the note-by-note building of highly-dissonant fortissimo chords. The ensemble next performed “Set Sail,” the first movement of Mystic Voyage by Susan Mast Bell (b. 1963). The piece began like a fugue, each part from the contrabass up through the E-flat entering with the lilting melody until all members of the ensemble were playing. The dance-like movement was undeniably reminiscent of a sea shanty. Next, the ensemble performed Clownery for Clarinets by Harry Stalpers (1926-2001). Full of chromatic runs, comical interruptions of the melody by the higher voices, and the passing of notes individually from one player to the next, Clownery for Clarinets was an amusing piece. It consisted of many unique themes and melodies, with sudden changes of style occurring often. The piece began with stereotypical circus music that might accompany a clown show at a circus, suddenly transitioned to a slow, sultry jazz theme, featured the first clarinet in a cadenza-like solo, then moved to a dance-like theme before finally returning to the original circus theme. The piece began to come to a close as the entire ensemble played fortissimo ascending and descending chromatic runs, then ended unexpectedly with a soft staccato note by the contrabass clarinet, eliciting laughter from the audience. Satoshi Yagisawa’s (b. 1975) Capriccio for Clarinet Octet was the final piece on the concert. The piece began with a light and bouncy theme, passing a staccato, ornamented motif across the ensemble, then transitioned to a lyrical melodic line featuring large leaps. The notable balance exercised by the ensemble again was apparent, with all parts beautifully supporting the forlorn melody as it flowed through the ensemble. The piece returned to the original idea before arriving at a quick and exciting finish. Thank you so much for the most complementary review!